Electric colors, layering patterns, high heels + mirrored sunglasses are my "ingredients" that spice up today's outfit. 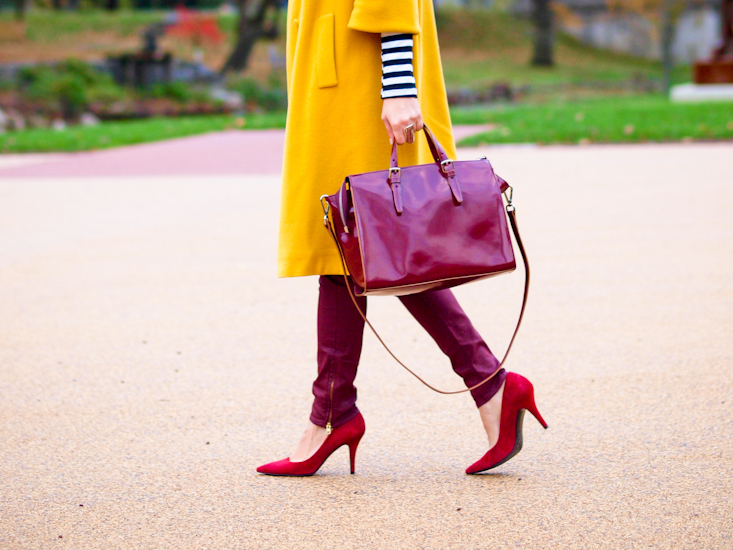 Once again I chose to wear striped sleeves ( thanks to ch-armz.com) with my yellow mellow coat, bordeaux accessories and this vivid silk shirt .Voila`! What do you think about this bold combination? P.S. If you like this pair of sunglasses, enter HERE to win 4 pairs of your choice! Whoa! This is such a beautiful outfit! You’ve put together all these piece together magically! THE STRIPES AND RING ARE MY FAVORITE..WHERE IS THAT RING FROM?? It is from TJ. Maxx Sheree, E&L brand . SO FUNNY..I HAD A FEELING..I’VE GOTTEN SIMILAR RINGS THERE..LOVE IT! Amazing combination!. Kisses from Spain. 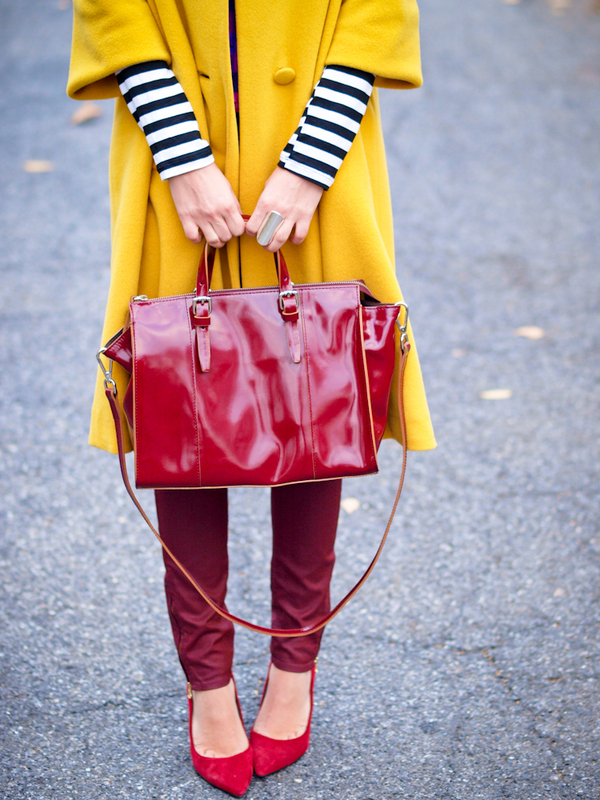 Love the color of the coat! And your bag, shoes, and jeans are the perfect match. Love it! beautiful coat. love its colour! Muy hermosa de amarillo..besos VERO!! great coat! I love size of it! the layering and the color combination here is just flawless, I want to recreate this look for myself!!! You look gorgeous! Beautiful mix! love the combination of colors! amazing pattern and color combination!! Absolutely beautiful..All the colors are well put together. That coat is gorgeous, I bet it keeps you warm too. Love the peek of stripes there and the lovely loose, wavy hair. Simply Gorgeous. I really fall in love with your style! Now you have a new follower from Spain ! !